Andy had a show at the Ileana Sonnabend Gallery in Paris and he took me, Chuck Wein, and Gerard Malanga with him. This is the famous show where Andy announced he was retiring from painting and going to focus on filmmaking. Chuck and I had really only known Andy for about 6 weeks and here we were off on a tour from New York to Paris, Madrid, Tangier, London, and finally home to New York. 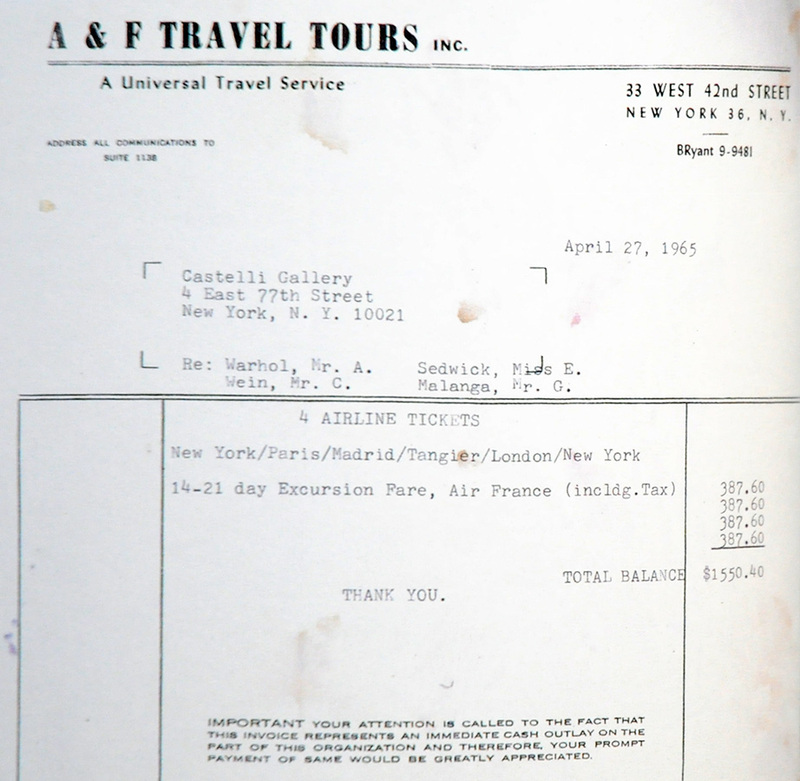 Oh, giggles and as you can see, the total for the 4 of us to go to all those cities on Air France was $1550! Boarding Air France for our flight from New York to Paris! In Paris Warhol’s gang startled the dancers at Chez Castel by appearing with fifteen rabbits and Edie Sedgwick in a black leotard and a white mink coat. In her deep, campy voice, strained through smoke and Boston, she said: It’s all I have to wear. May 1, 1965: Andy, Me, Chuck & Gerard in bed in our Paris hotel while waiting for Andy’s Flowers show to open at Gallerie Sonnabend. Wow! I sure wish we could still get 1965 prices for air travel today. And you didn’t even have to have your luggage inspected back then! Ileana Sonnabend gives Warhol a show in Paris at her gallery. Andy asks if he can take his entourage. Sonnabend is only too happy to send him more tickets. If he comes with a pretty underdressed girl he’s bound to get more press, she tells him. At Castel’s, a fancy Parisian restaurant, the hat-check girl asks Edie if she’d like to check her coat. No, she says, it’s all I’ve got on. Edie’s luggage contains nothing but another white mink coat. In Paris, Andy announces he is retiring from painting and will henceforth devote his life to making films. Paintings don’t go far enough. Films are easy. Andy knew he was at a crossroads. He understood that the three-years-of-fame rule applied to him, too. May 1, 1965: Andy, Me, Chuck & Gerard in bed in our Paris hotel while waiting for Andy’s Flowers show to open at Gallery Sonnabend. Ileana Sonnabend was married to New York gallerist Leo Castelli for 25 years. They were divorced in 1959 but remained lifelong friends. 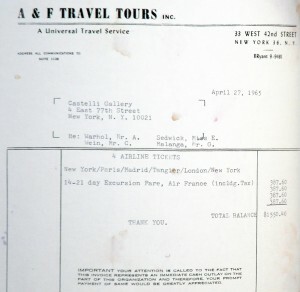 Andy showed at Leo Castelli Gallery twice last year (1964) and would show with Castelli for years to come. I used to also believe in re-incarnation, but that was in my other life. No worries Jeff – you’ll believe again in your next life!